As an American living in a privileged bubble, it’s hard to know the rawness of life outside, even when I witness it first-hand. I recently took a photography assignment in Honduras. The last time I was in that country was in 1999, right after Hurricane Mitch had devastated the region. Perhaps a bit naive, but truly well-intentioned, a group of my college friends and I headed there on spring break to help rebuild a village in the remote mountains a day’s drive from Tegucigalpa. Without electricity, we worked exclusively by daylight. At night, we slept outside under a sheet of stars, unaware of just how dangerous and chaotic the world was around us. Over a decade later, I returned, this time wearing a different hat, and much more alert to the reality of the situation there. I trolled the U.S. State Department’s website daily for updates from that country, which claims the highest homicide rate, per capita, in the world. Although the crime rate has steadily declined since 1999, when it was at its highest, kidnappings, carjackings, and other unmentionable crimes are still common occurrences. Recently, six people were stopped while leaving the San Pedro Sula airport, where I arrived a week later, dragged out of their cars and sprayed with bullets. The gunfire was so intense that people inside of the airport were injured. So, I traveled by day in an armored vehicle, with bullet-proof tires and an armed driver. At night, I was locked behind doors with machine guns keeping watch outside. As an American, it’s hard to pop that privileged bubble and step outside. The closer you get to the equator, the more intense life seems to get. The colors are more vivid, the textures are more tactile, the people are more passionate. Despite mass poverty, the oppression of crime, and constant disasters, natural and political, Honduras was a land full of warmth and generosity. It was rain season, and a thick blanket of clouds plodded slowly across the sky for the length of my stay, Hurricane Rina in the making, creating breathtaking moments on the vast Lago de Yojoa in the interior, and peaceful vignettes in the lush jungles, a quilted patchwork of palm forests and marshland. There were no baller meals to be had. But I didn’t miss them. I had fresh fish almost every day, fried whole, with crispy fins, served with fresh limes, pickled onions, and rice and beans. There were bags of rambutan, acquired from road-side stands, those furry balls of red that we cracked open for their fleshy, lichee-like fruit within. And there were breakfasts of papaya juice, fried plantains, and stews of ropey pulled pork. My trip started in Miami, where I had dinner at Yardbird, Jeff McInnis’s new Southern table on South Beach. I liked it enough to return for a second helping a few days later, when I returned from Honduras; a quick tuck and a sleepless pit stop before moving on to Mexico early the next morning. Thirty-plus countries I’ve visited, and many of them multiple times, but I had never visited our neighbor to the south. My friend Adam of A Life Worth Eating has been spending a significant amount of time in that country. And, when he heard that I was heading down to Central America, he invited me to stop in Mexico for a week of eating before returning home. Boy, am I glad I did. After a drive over the beautiful volcano range that separate the states of Mexico and Puebla, with Popocatepatl smoldering in the distance next his sleeping lover, Iztaccíhuatl, I met Adam and our friend Artemis in Cholula, the capital of speed bumps. We wandered through the markets, exploring the local produce, gawking at crispy boards of chicharones bigger than I. We paused to watch a butcher carve a side of beef, hanging floor to ceiling, and admired the enormity of pigs dangling by their hooked knees, fresh from the slaughter. 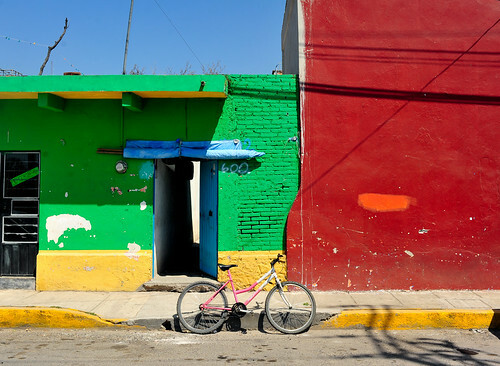 Not twenty-four hours in Mexico, I had fallen in love with the place. Adam introduced me to cemitas milanesa, a local sandwich stuffed with an oversized cutlet of veal, pounded and breaded; avocado; popalo, a local herb tasting of basil and cilantro; chipotle, smokey and sweet; and smothered with a stringy cheese called cotija, which was pulled fresh every time. We had many, many, many of them, all washed down with a rainbow of aguas frescas – watermelon, soursop, tamarind, and my favorite, guava. 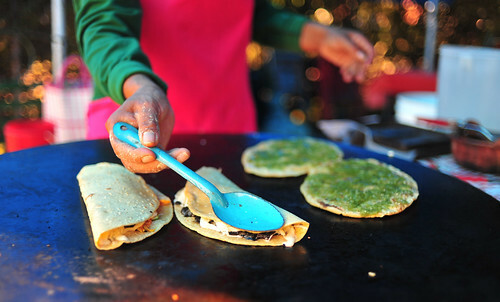 We ate quecas and quesadillas at road-side stands. It was the same scene every time: a stout woman, with her tortilla press, a griddle, a stool, and a table under a tarp strung up between trees. We stopped, ate, and then walked around town until we happened upon another, where we would eat again, and then again. Huitlacoche, chicharron, and flor de calabaza (zucchini blossoms) – the ingredients were simple, but fresh and good. And those tortillas – I could eat them warm with nothing but a dash of salt. The ancient and the modern co-exist in Mexico in stark contrast. In Puebla, we visited an old ice factory, now converted into a hotel and restaurant. I loved the preservationist mindset here – the present exists to prolong the past, instead of destroying the past to create the present. 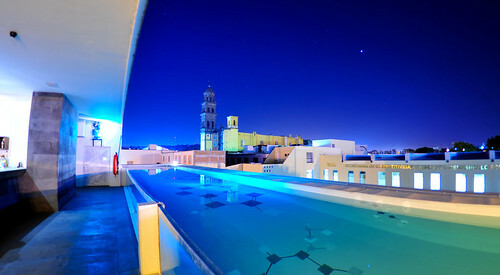 On the rooftop, we lingered to admire the view from a pool-side bar with a magnificent view of an old church, and the stars beyond. As the sun set, Adam and I went night shooting, making subjects out of abandoned ruins with our cameras, and basking in the fluorescent glow of the cathedral in the zócalo of Puebla. Afterward, we went for a midnight taco run: al pastor, al pastor, al pastor, shaved from a turning spit with a pineapple on top. 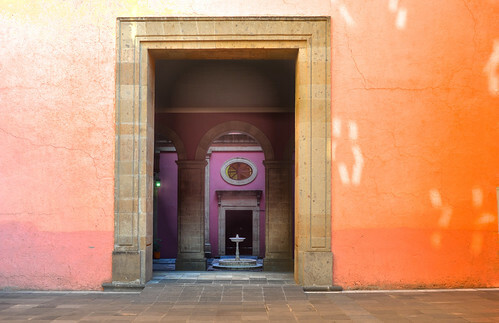 We walked the shizz out of Mexico City, the country’s Distrito Federal, a sprawl of incomprehensible magnitude rising from the ashes of Tenochtitlan, the ancient Aztec city built on Lake Texcoco. There were more markets, full of more produce, more chicharones, and instead of cemitas, tostadas. We grazed the streets, eating elote out of a stand: hot corn on the cob, slathered with mayonnaise, rolled in grated cheese, and dusted with chile powder. The corn here is different from the ones that crowd the fields outside of my home in Kansas City – the kernels are much larger, much more fibrous, paler in color, and a lot less sweet. At El Cardinal, we had chilaquiles verdes, and nata, a milky sweet cream, spooned onto warm tortillas and sprinkled with salt. That might have been my favorite mouthful all week. We ate at Pujol, Enrique Olvera’s celebrated revision of Mexican cuisine. And we ate at Biko, where two Spaniards are attempting to establish a comprehensible voice in Mexican fine dining. And of course: al pastor, al pastor, al pastor, again, shaved from a turning spit with a pineapple on top. And in between there were Mexican candies of all shapes and colors. Artemis introduced me to tamarind paste wrapped around straws and dusted with chile powder; unbelievably tart suckers, also coated in chile powder; crunchy clusters made from toasted amaranth; and mazapán, sugary peanut powder pressed into tidy little pucks. In the city’s spacious zócalo, I found dozens of colorful alebrijes – dream chasers – keeping watch under a ginormous, flapping bandera, on which an eagle, perched on nopales, snags a snake, a sign to the Aztecs to settle and build. 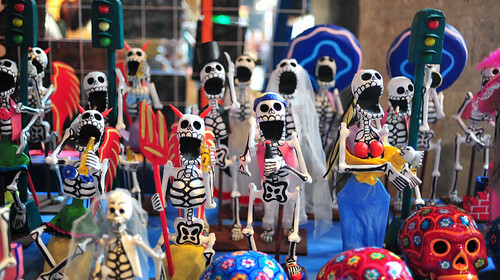 Everywhere, calaveras de azúcar – sugar skull candies – and skeletons heralded the advent of Dia de los Muertos, just a few days hence. Outside of the Museo Nacional de Anthropologie, we were dwarfed by the mythic sculptures of Javier Marín, enormous heads that seemed to have tumbled from Mount Olympus. I admired “El Ángel,” the golden symbol of the Distrito Federal, atop her pedestal on the Paseo de la Reforma. And at night, I watched Diana shoot the moon outside of our hotel. I cannot thank Adam and Artemis enough for their hospitality, or the people of Honduras and Mexico for their warmth and generosity. I’ll be back. 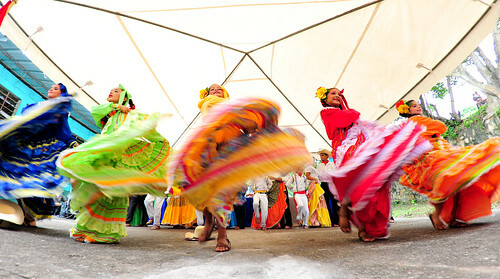 Photos: A fly on a metal door, San Andres Cholula, Mexico; young children dancing in traditional garb, Coninca, Honduras; a colorful street scene, San Andres Cholula, Mexico; quecas on the griddle, San Pedro Cholula, Mexico; the view from the top of La Purificadora, Puebla, Mexico; Palacio Nacional, Mexico City, Mexico; skeletal figurines, Mexico City, Mexico; Diana, Goddess of the Hunt, Mexico City, Mexico. ~ by ulterior epicure on November 12, 2011.
wonderful series of photos, very interesting. Great post. Great review, glad you’ve been here. Hope you come back soon, maybe to Mayan Riviera, good dinner over there.